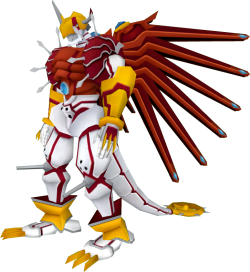 ShineGreymon is a Light Dragon Digimon whose name and design are derived from "Shine Greymon", it is also a pun on "rise and shine". It fights with the red-hot solar energy it accumulates, and its "GeoGrey Sword" contains the condensed power of Gaia. Attacks the opponent with 3 blades on the back of your hands. Creates two fireballs on both hands and throws them at the opponent. This page was last modified on 22 April 2019, at 01:40.